If you need help in keeping your cargo area in order then you will be pleased with this Scion xB interior cargo net. This interior cargo net can be used as a carry all for that needed extra Scion xB storage capacity. With this Scion xB interior cargo net you now have additional storage for most anything. Get this interior cargo net for your Scion xB to help keep that sports gear in one location. 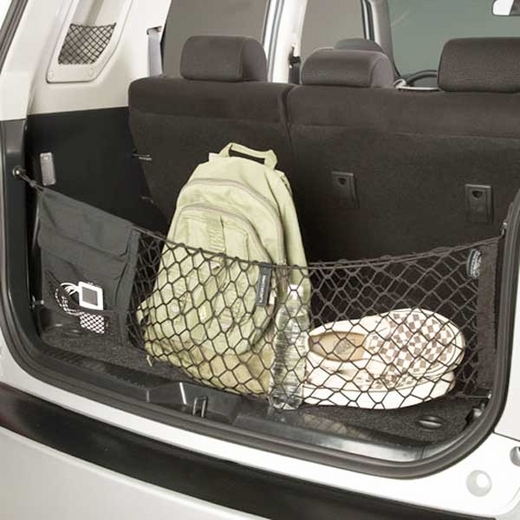 Custom-crafted for the Scion cargo area, the cargo net is designed to hold a variety of everyday items�from groceries to athletic gear�and help ensure they don�t shift around or tip over. The cargo net features an envelope-style design including fabric pockets for stashing smaller items and durable netting that accommodates bulky items as well. The net attaches to defined points in the rear cargo area, making it easily accessible. Can be installed or detached in seconds, and folds flat for storage when not in use. Custom-crafted for the Scion cargo area, the cargo net is designed to hold a variety of everyday items�from groceries to athletic gear�and help ensure they don�t shift around or tip over. The cargo net features an envelope-style design including fabric pockets for stashing smaller items and durable netting that accommodates bulky items as well. The net attaches to defined points in the rear cargo area, making it easily accessible. Can be installed or detached in seconds, and folds flat for storage when not in use. Am so enjoying my cargo net... Love that it keeps things from moving around. Can't figure out what to use the pockets for, but am sure I will think of something!